I’ve recently returned from a walking holiday in Scotland with some of my good friends and family. We embarked upon a somewhat epic 100 mile walk from Milngavie to Fort William (along the West Highland Way). Sadly I didn’t manage to complete the entire way because I ended up giving myself a very bizarre walking injury (I’ll spare you the details as it’s not for the faint hearted). In spite of that little blip in proceedings I tried to turn it into my own mini adventure and make it as positive an experience as I could. The scenery and varying landscapes we came across along the West Highland Way were often very rugged and filled with texture from the shaggy grass and rocky protrusions of the surrounding hills; couple that with the ominous looking clouds (often followed by ominous weather) that we experienced and it perfectly set the scene for some very dramatic looking black and white photos. This photo of my friend taking a moment to look over the rest of our journey from Milgavie to Drymen really reminds me of the Romantic painting Wanderer Above the Mists by Caspar David Friedrich. Our first views of Loch Lomond after walking out of Drymen and then ascending Conic Hill. Our team, 10 miles into our walk, scaled Conic Hill with a hearty breakfast of a cereal bar and a sip of whisky lining our stomachs, safe to say that was a tough day of walking. I found this bear in an old backpack that was a family hand-me-down. I figured, by the old tickets and luggage tags that I found in the backpack, that it had been around the world a lot already so why not keep up the tradition. Travel Bear, as it is now known, has become my good luck token on all of my adventures. Much of the first third of the West Highland Way is comprised of walking (and sometimes scrambling) along the shores of Loch Lomond where the scenery differs beautifully from one mile to the next. Occasionally the path gives way to a little shingle-strewn beach and, if you’re brave/ mad enough (no names mentioned here), you can enter the chilly waters for a swim. Fort William is the official end to the West Highland Way and because I reached it a little earlier than my (far more robust) comrades I had a bit of time on my hands to explore it. 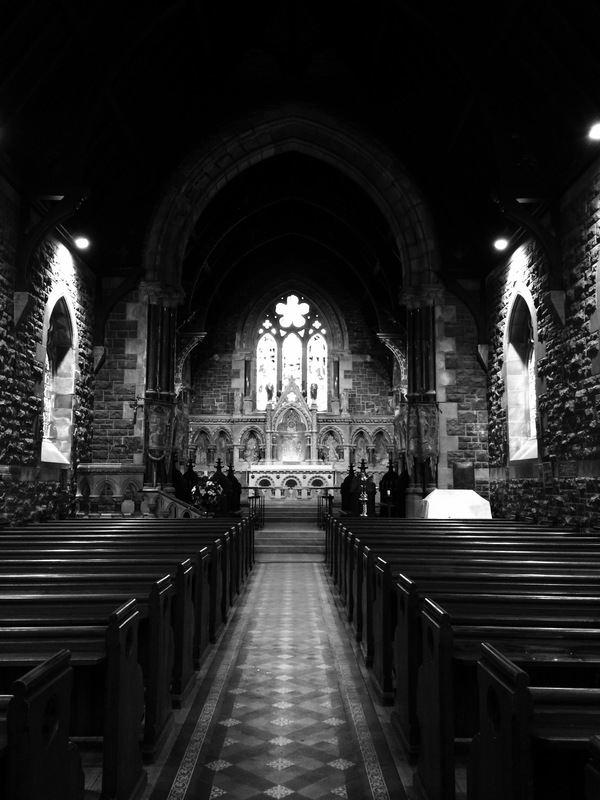 I discovered St Andrews Scottish Episcopal Church just off of the Fort William High Street. The Church dates back to the 1880s and has striking stone walls whose somewhat dour appearance is punctuated by the bright flashes of glorious stained glass windows. Travel Bear and I finally made it to Glen Nevis which lies at the base of Ben Nevis Mountain. Most of our group were to battered and weary to climb the mountain in the end but two of our hardiest members did managed to get to the summit and back in a mere 4 hours. Those of us that that didn’t make it up Ben Nevis sought out sanctuary in the laundry room of the camp site which still had amazing views of the surrounding mountain range and was warm, dry and shortly filled with everyone’s clean clothes. To finish off my adventure I was given a very brief Scottish Gaelic lesson from a friendly Fort William taxi driver who informed me that apparently Ben is the Gaelic for mountain, Glen means valley and of course Loch means lake. I think my time on the West Highland Way did at least teach me that I enjoy life (and walking) at a slightly slower and less strenuous pace, lesson learnt and adventure achieved.